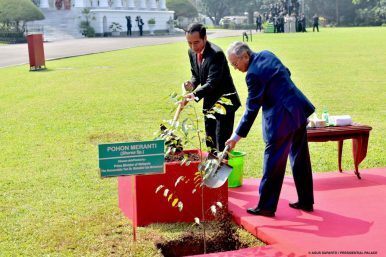 A picture from a previous meeting between Malaysian Prime Minister Mahathir Mohamad and Indonesian President Joko "Jokowi" Widodo. Earlier this week, a Malaysian defense delegation paid a visit to the Indonesian defense ministry for a scheduled meeting. Though the engagement was just one among several, it nonetheless put the focus on the ongoing development of bilateral defense ties between the two countries amid wider changes at play in their domestic and foreign policies. As I have pointed out previously in these pages, despite some disagreements on the security side that they continue to manage – ranging from illegal fishing to the outstanding Ambalat dispute – Malaysia and Indonesia, the two main Muslim-majority countries in Southeast Asia, do maintain an overall defense relationship. While the defense relationship is officially centered around a security cooperation framework rather than a defense cooperation agreement, at present, it involves several aspects including exchanges, visits, and some components of education and training collaboration as well as exercises. The development of defense ties has continued on into 2019, even amid changes in wider regional dynamics as well as domestic politics, with the shock election victory by Malaysia’s opposition in elections last May bringing former prime minister Mahathir Mohamad back to power, and Indonesia itself about to head into its own general elections later this month. There has also been discussion about deepening defense collaboration and also further strengthening institutional framework that currently exists for this realm of cooperation as well. The continued development of bilateral defense ties between the two countries was evident earlier this week which saw a delegation from Malaysia’s Armed Forces Defense College (MPAT) pay a visit to Indonesia’s defense ministry. A Malaysian delegation, led by First Admiral Mohd Fadzli Kamal bin Mohd Mohaldin, who had assumed his role as the Commandant of the MPAT in January this year, was at the ministry for a scheduled exchange. Per the account of Indonesia’s defense ministry, the exchange between the two sides involved a series of interactions. The Malaysian delegation met with several Indonesian officials, including the strategic policy director of the defense ministry, Bonifacius Widianto S, where they discussed the state of bilateral defense ties and other regional and international issues of mutual interest. There were also other private discussions that took place, as well as a presentation shared between the two sides on Indonesian defense policy. Unsurprisingly, few additional details were publicly disclosed about the private deliberations. Nonetheless, engagements such as these will continue to be important to watch to get a sense of how the overall bilateral defense relationship evolves with time amid wider domestic, regional, and global changes. What Does Mahathir’s Visit Mean for Indonesia-Malaysia Relations?What’s Behind Malaysia’s New Defense White Paper Talk?What’s Next for the Malaysia-Singapore Border Disputes?First Military Chief Visit Spotlights Malaysia-Singapore Defense TiesWhat’s in the New Japan-Malaysia Defense Pact?